Finally got round to this. Today, I have just a Raspberry Pi Model A+, packaged as a Lapdock cartdrige. I have a BBC B with an ATPL Sideways ROM board fitted. The BBC B serial number is 01-ANB01-3022697. I've had this Master for a while now but what I didn't do was post the serial number anywhere. I'm not sure if this is the right part of the forum for this, I seem to remember there 'might' have been a better thread but can't seem to find that. Anyway, I just want to ensure this number does not get lost for all the people keeping records for posterity. The last number is hard to read, hence the reason for two pics so people can see the authenticity of the machine. My Electron has 07-ALA0 136748 stamped on it's undercarriage. BBC model B, issue 7, tape only, assembled in Hong Kong. Both fully functional. The BBC is missing a key. My Atom has a full complement of memory together with the floating point rom. No printer connection hardware. The regulators have been bypassed. now looks brand new, straight from the dishwasher! Last edited by CMcDougall on Sun Nov 25, 2018 2:04 pm, edited 4 times in total. There is another Electron in my collection but it's serial number has gone, possibly because someone put it in a dishwasher?!?! I have heard of retrobrite for yellowed plastic, but until I came to this forum, I never heard of putting old computers in a dishwaser! Does it really work? I spent a couple of hours scrubbing an Electron case and the keys recently, so it would be a time saver if it does indeed work (as long as no one tells the wife what I might have put in the dishwasher). Can you double check this one please? It's 100,000 out from the current highest 07-ALA01 serial! 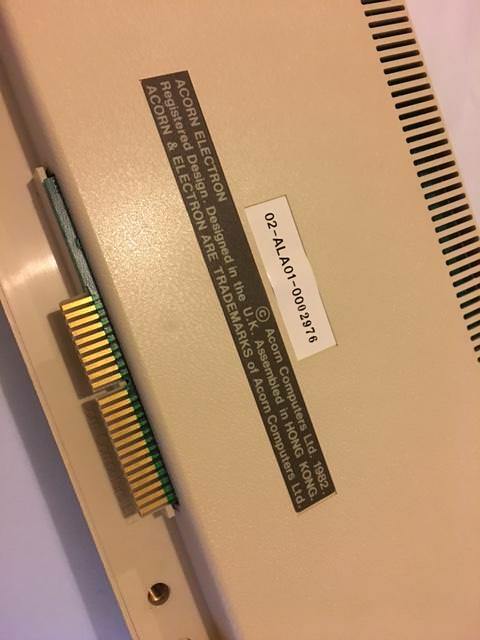 Also, for the Compact, could you post the keyboard serial as well as the disc box serial? I'm using the former to track numbers as there seem to be more than a few keyboard-only Compacts in use. Last edited by SarahWalker on Wed Nov 28, 2018 5:43 pm, edited 1 time in total. Didn't realise the Compact had a separate keyboard serial, but I have checked and no, I can't The label is partly torn away on the keyboard. Electron SN is correct though. You know, you had me thinking I had gone mad, berating myself for failing to copy a simple number correctly. Turns out I am sane after all... Well, who knew, me sane? See attached pictures of proof of my sanity. Although my friends will probably say "jury's still out" on my sanity plea! Last edited by Leew on Thu Nov 29, 2018 10:41 pm, edited 1 time in total. I think the F key insert was for Citadel 2... I developed it originally by swapping the source code out of sideways RAM in chunks.